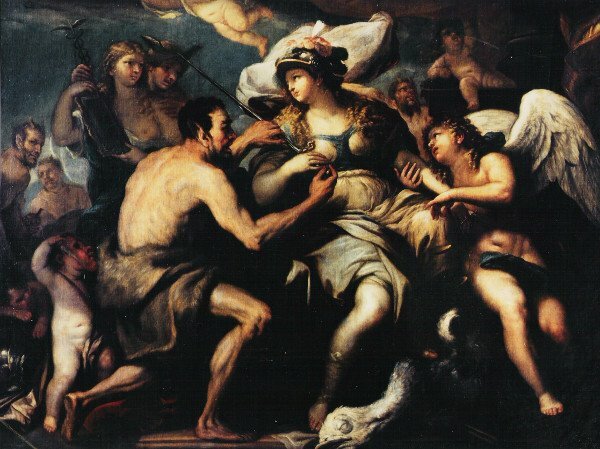 Luca Giordano, initially sensitive to the late painting of Ribera, early leaves Naples to reach Rome where he becomes familiar with Pietro da Cortona's opera; subsequently he goes to Florence and Venice. In Venice he meets the great Venetian tradition of painting and he learns to draw his colours palette closer to the chromatism of Venetian Masters. In 1653 he goes back to Naples and his technique evolves into a Baroque style, well seen in Neapolitan collections of painters such us Rubens and Poussin. The long stay of the painter in the native town allows him to know and study the luminist atmosphere portrayed by the Caravaggesque painter Mattia Preti. In 1695 he goes back to Florence and Venice and during the following ten years, his Baroque technique becomes mature and melts with the art/style of Pietro Cortona. This period is very profitable for him; he works for some great compositions as Cupola di Santa Brigida in 1678, San Gregorio Armeno in 1679, Affreschi della Bibilioteca e della Galleria di Palazzo Medici Riccardi in Florence in 1682/85. His pictorial evolution takes him to a new level, towards a progressive fading of the form and an evident interest in the luminist values. After ten years spent in Spain painting for the Court (Escorial Casino del Buen Ritiro), for the clergy (Monastero di Nostra Signora de Guadalupe), and for private individuals, he goes back to Naples and in 1702 he begins painting the last masterpiece of Santa Maria Egiziaca and the great dome in Certosa of San Marino. The theme of the painting is Justice disarmed. It's a great allegoric composition, typical of the vast production of the artist; in this case the influence of Pietro da Cortona mixes together with the previous inspiration of the Venetian school. It can be seen in the fluid and thin matter, in the light sfumato of the garments and in the plump faces of protagonists. The golden and clear shade that envelops the forms and dilutes colours creates a Baroque atmosphere. The painting is in condition and on original canvas. Painting notified by Italian State. O. Ferrari - G. Scavizzi - Luca Giordano, Napoli 1966, 3 vol. O. Ferrari in Civiltà del '700 a Napoli, cat. Mostra di Napoli, Firenze 1979. O. Ferrari in Civiltà del '600 a Napoli, cat. Mostra di Napoli 1984. V. Pacelli in: Scritti in onore di Raffaello Causa, Napoli 1988. O. Ferrari - G. Scavizzi - Luca Giordano, Nuove Ricerche e Inediti, pp.48 (A098),53, Electa Napoli 2003.